The Pulling & Balance Patriotic Harness is the same great design as our regular Pulling & Balance Harness with a beautiful new feature. The colors and embroidery of the new Pulling & Balance Patriotic Harness are all done in a red, white and blue color theme. It brings honor and recognition to a USA patriotic motif. The straps are all made of red webbing, the chest plate and back plate are dark blue and there is white Sherpa under the plates and over the straps of this harness. The back plate and the chest plate of this Pulling & Balance Patriotic Harness are embroidered with silver and white stars. This harness is one of the most supplied harnesses with the service dogs we train that have a handler that has mobility issues. The design of the original pulling & balance harness began with a need for a form fitting harness that stays upright on the dog while pulling a wheelchair and giving balance to the handler when they transition from the chair. A dog’s strength for pulling comes from the chest and our Pulling & Balance Harness is a safe and effective way to utilize that power. Unlike pulling a wheelchair that is attached to the dog’s collar this harness takes the stress away from the dog’s neck and it is much safer for the dog. Attached on the top of the Harness over the dog’s girth is a stand up handle. The handle is positioned so it is very easy to grab onto the dog for balance. The handle also comes with a removable sherpa cover. The heavy welded D-ring for pulling is also located on the top of the Pulling & Balance Harness. It is very easy to hold onto the handle and snap the lead to the D-ring. The Patriotic Pulling & Balance Harness comes with two 1.5” x 3.5” patches. Any specialty patches are an extra option. 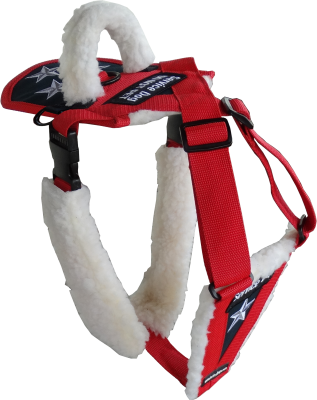 Our Patriotic Pulling & Balance Harness is very simple to put on the dog. You open the girth strap buckles, slip the harness over the dog’s head, and run the chest pad bottom guide strap between the dog’s front legs and then back up to where the girth strap meets to buckle the harness. The front chest straps have double adjustments. The girth has two side release buckles and adjusting slides. The straps come with removable sherpa covers. Nice feature for washing the covers. All the stress points on the dog are padded. The underside of both the back plate and chest plate are felted, and then covered with sherpa. The girth strap has two removable washable sherpa covers. The back and chest plates are covered on the top with rugged 1000 denier materials. This Patriotic Pulling & Balance Harness should fit snug around the dog’s girth. When measuring your dog measure the girth just behind the dogs front legs and up over the back of the dog. This Patriotic Pulling & Balance Harness comes in two size options. Additional removable Sherpa handle covers are available. This Patriotic Balance & Pulling Harness is designed to work directly with our Wheelchair Pulling Leash (#707588).